Building on the current strength in the market for modern sculpture and the intense demand for exceptional works by Henry Moore, Christie’s is pleased to announce the inclusion of a monumental sculpture by the artist in the New York Evening Sale of Impressionist and Modern Art on 5 November 2013. Moore’s bronze Reclining Figure, created in 1969-1970, measures over 11 feet, and is length-wise the largest single-piece sculpture on this theme that the artist ever created. Estimated at $6-8 million, the sculpture is being sold by a Distinguished Collection, where it has resided for 35 years. Reclining Figure will be prominently displayed outside at Christie’s plaza in Rockefeller Center in the weeks leading up to the sale. Moore’s Reclining Figure is a masterpiece among the monumental sculptures of his late oeuvre. The work possesses the natural undulating flow of his organically inspired female features, and a sense of balance and repose that is regarded as an enduring hallmark of the sculptor’s achievement. Reclining Figure evokes the natural forms of the rolling hills and fields of the sculptor’s native Hertfordshire, England. The figure incorporates a series of contrasting forms that commence with the vertical points of the head and arm that spring from the earth at one end, follow along the twisting course of her torso, marked with sudden protrusions in the forms of her breasts and pelvic bones. The asymmetrical aspect of the figure leads the viewer to experience multiple points-of-view. Prices for Henry Moore have soared in recent years, in keeping with increasing appreciation and interest among collectors for superb examples of modern sculpture. 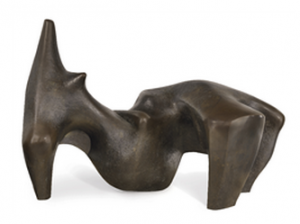 In February 2012, a world auction record for Moore was established at Christie’s London for Reclining Figure: Festival, which achieved £19,081,250 ($30,316,571), against the pre-sale estimate of £3.5-5.5 million ($5.5-8.7 million). Another notable recent result for modern British sculpture includes an artist world auction record for Dame Barbara Hepworth’s Curved Form (Bryher II), which fetched £2,413,875 ($3,594,260), exceeding the pre-sale estimate of £1-1.5 million, at Christie’s London in July 2013.